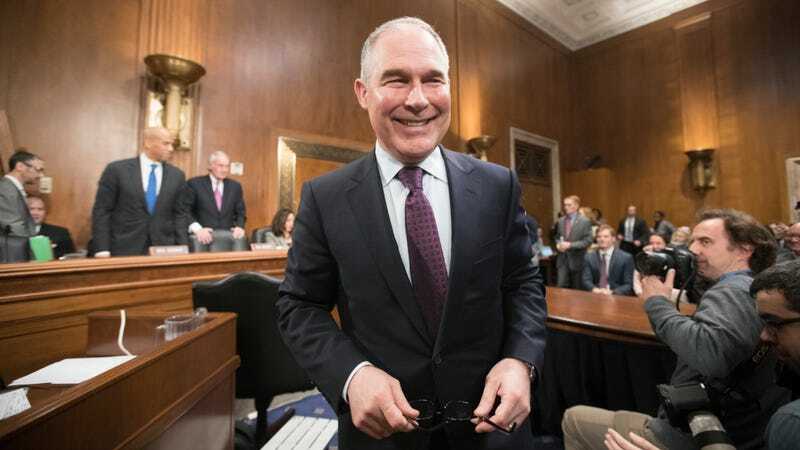 On top of pending investigations into snake oil (literal oil) huckster Scott Pruitt’s myriad ethical breaches, Republican Congressperson and House Oversight Chairman Trey Gowdy (SC) added further reasons to investigate the EPA administrator on Friday. The offenses are not like destroying the climate so hard that I probably won’t have babies–more like wasting exorbitant sums of taxpayer money on first class flights, but whatever! Whatever it takes to get rid of this man. Jaywalking, unpaid parking tickets, pee tape, I don’t care! Gowdy has called for interviews with several high-level shady functionaries and requested travel documents from security chief Nino Perrotta who “egged on” the lavish expenditures, Politico reports. Gowdy also requested the itinerary and travel documents for Pruitt’s now-infamous Morocco trip during which he reportedly went to sell Morocco on American gas. As of Friday, the EPA’s Office of the Inspector General was also conducting four audits at the agency and investigating the former “no-show” top aide Samantha Dravis, and the Office of Government Ethics has called for another, though it can’t take direct action. The success of our government depends on maintaining the trust of the people we serve...The American public needs to have confidence that ethics violations, as well as the appearance of ethics violations, are investigated and appropriately addressed. Notably, Apol’s predecessor threw in the towel in July 2017 after heavily implying that there was little he could do under the current administration. Last Saturday, as reported by Vox, Gowdy said that he “doesn’t have a lot of patience” for widely-reported scandals. “It gets worse every time there’s a report in the news,” he said at a book signing. The investigations are expected to take months, Vox notes. Meanwhile, a black woman just got a five-year prison sentence for trying to vote. What Time Will Scott Pruitt Be Fired?